Wendy’s aimed for a home run with its last text to win and it hit the ball out of the park by using Sweeppea’s text to win platform. A summer promotion for franchisees in the Northeast, Wendy’s offered free tickets to NY Yankees games for more than 100 lucky winners. In collaboration with Empower Creative; tray liners, bag stuffers, signs and digital media all promoted the campaign to customers, who had to visit a local Wendy’s to get the sweepkey word needed to enter. 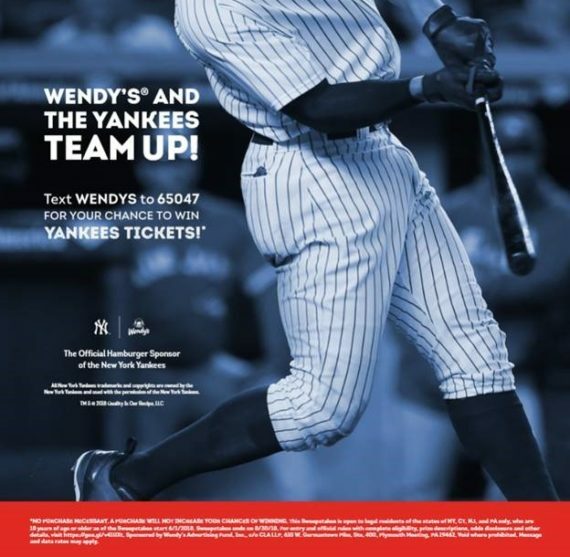 Customers entered by texting WENDYS or YANKEES to 65047 for a chance to win 4 tickets to a Yankees game. With thousands of entries, the text to win was a success for Wendy’s. The company gave tickets to more than 100 winners, allowing each to attend a game with family or friends from July through September. Prize: Winners received four tickets to a NY Yankees game at Yankee Stadium.